Based on reviews from 36 experts and 4,290 users. Learn how our rankings work or see our guide to Adidas Copa football boots. Updated Apr 2019. Every football player knows what an Adidas Copa football boot looks like, from the high-quality leather upper to its iconic tongue. The name alone is synonymous with quality. From the very first time an Adidas Copa football boot was released more than 30 years ago up to the present, it is considered as one of the best-selling football boot silos of all time. As innovations are introduced, the Adidas Copa football boot remains true to its core DNA. Right out of the box, Adidas Copa football boots are a dream to wear. The softness and flexibility of the leather upper are suitable for players who place comfort as their top priority in choosing a football shoe. Over time, this material molds to the shape of the foot. Thus, it provides an almost customized fit. Also, the solid nature of leather provides plenty of protection against impact injuries, such as getting kicked or stepped on. Premium kangaroo leather is a central feature in top-tier Adidas Copa football boots. Low-end models, on the other hand, use calfskin, full-grain, or synthetic leather for the upper. Probably the most iconic feature of an Adidas Copa football boot is its fold-over tongue. It is unlike any other football shoe tongue on the market. The length is longer, so it can be worn in many different ways. As the design and performance of the Adidas Copa football shoe evolve, so does the tongue. For the Adidas Copa Mundial, the tongue is crafted using high-quality leather. Thus, it gives the football shoe a soft and consistent touch on the ball. With the Adidas Copa 17.1, it uses a compression tongue that goes under the footbed creating a unique fit when worn. The classic design of an Adidas Copa football boot is something that most, if not all, football players are bound to recognize even from afar. Because of its simplicity, it has become the gold standard for all heritage-style football boots standing alongside the Nike Tiempo and Puma King series. Created and released more than three decades ago, the simple yet elegant look of an Adidas Copa football boot has stood the test of time and outlived a lot of player careers. Even with the 2017 version Adidas Copa football boots, the company still retains its timeless black and white color scheme. To keep up with the modern trends, this sportswear manufacturing giant from Germany managed to release Adidas Copa football boots in exciting colorways in the form of the Copa Mundial Samba Pack. The Adidas Copa football boot soleplate consists of 11-12 studs that provide excellent traction on firm natural grass. All studs are of equal size and length, but the ones in the heel are slightly wider to provide a stable ride while running on the pitch. Adidas Copa Mundial (1979) - Classic. Timeless. Durable. These are just some of the words used to describe Adidas’ longest running football boot. Although it was initially released in 1979, its first appearance on the pitch was in the 1982 FIFA World Cup. The Adidas Copa Mundial is still raking sales for the company more than three decades later. This proves that it is indeed the gold-standard of all the heritage-style football boots. This Adidas Copa football boot feels soft and comfortable right out of the box. Its upper is made up of 100% kangaroo leather. Striking and juggling a ball using this Adidas Copa football boot is straightforward and feels natural. Sitting on a direct-injected outsole, this Adidas Copa football boot gives the right amount of stiffness in the midfoot area. Where this football shoe lacks in innovation and technology, it makes up for by consistent quality and durability. Adidas Copa Mundial 25th Anniversary (2007) - This limited-edition Adidas Copa football boot was released in commemoration of the 25th anniversary of the company’s most iconic football shoe. Each pair comes in a special commemorative gift box, a towel, a wooden shoe tree, and a premium shoe conditioner. Instead of the standard silver print found in the original Adidas Copa Mundial, this special football boot is marked with a gold “Adidas Copa Mundial” badge. The upper is made of premium kangaroo leather while the iconic tongue has a new logo in honor of the Copa’s landmark year. Adidas Copa Mundial White Edition (2013) - Another limited-edition Adidas Copa football boot has been released three decades after the first launch. Despite retaining its old-school vibe with the K-leather upper, this new Adidas Copa football boot model has some slight modifications from its 1979 counterpart. Apparently, the colors have been reversed making white as the prominent color. Copa Mundial Samba Pack (2014) - A year after the successful release of the Copa Mundial White Edition, Adidas released the more colorful Adidas Copa Mundial Samba Pack. These eye-catching Adidas Copa football boots preserved its old-school leather upper construction as well as the dual-density, direct-injected outsole and traditional stud configuration. Adidas Copa SL (2016) - This is a limited-edition Adidas Copa football boot that has a modern twist. It is an excellent alternative for those who want the retro look without the leather touch. Some parts of the original Copa Mundial have been stripped off to make this Adidas Copa football boot more lightweight. The premium kangaroo leather upper is replaced with an ultra-thin HybridTouch material. It retains the padded feel on the ball, and at the same time, it is also lightweight and waterproof. As for the iconic tongue, Adidas has stitched it on the boot, so it stays down. Adidas Copa 17.1 (2017) - 30 years since the release of the original Copa Mundial, Adidas released a re-imagined version of the football boot - the Adidas Copa 17.1. This version of the Adidas Copa football boot has been redesigned and modified to fit today’s modern game. Comparing both football shoes, you will see that externally, they look very much alike. However, when you take a closer look, you will find a few pieces that are manufactured differently. The upper of this Adidas Copa football boot is made of premium kangaroo leather stitching across the forefoot. A new key feature of this Adidas Copa football boot is its internal cage system. The elastic compression fit tongue creates a natural cradle effect to the foot by extending down under the footbed. It provides a comfortably snug fit in the midfoot area. This Adidas Copa football boot sits on a redesigned SprintFrame outsole. It has a wide plate that comes with 12 low profile conical studs. Thus, it provides even weight distribution for the player. How to keep the Adidas Football shoes in optimum condition? As with all kinds of natural leather, maintenance is required. You should clean your Adidas Copa football boot after every game, especially when playing on soft grounds. Use a damp cloth when wiping the leather upper portion of the football boot. Do not submerge your football shoes in water. Keep in mind that soap dries out leather, so it is best to stay away from it. You may use clean, room-temperature water to dampen the cloth. In cleaning the studs, fill a small bowl with warm water and a little bit of mild soap. Liquid dish soap and hand soap are best examples of mild soap. Use a soft-bristled brush to clean the studs of your Adidas Copa football boot. Wipe away any soap residue using a damp cloth. Air dry your Adidas Copa football boot. Do not use direct heat like a hair dryer or direct sunlight, in drying your leather football boot as it may cause more harm than good. Leather shoes should dry from the inside out. The opposite can cause the material to crack and reduce its lifespan. Stuff old newspaper inside your shoe to absorb moisture. You may use a neutral leather balm to add moisture and balance the pH of the leather upper. Coat the leather with a thin layer of leather balm and wipe away the excess using a dry cloth. This conditioning product will extend the life of your Adidas Copa football boot. When not in use, store your Adidas Copa football boot outside the bag and in a place where it will not be crushed and flattened. Who designed the Adidas Copa Mundial? The original Adidas Copa football boot was designed by no other than the founder of Adidas, Adolf Dassler. It was the last product innovation that he personally got involved in before he passed away in 1978 - a year before the Adidas Copa Mundial was initially released. 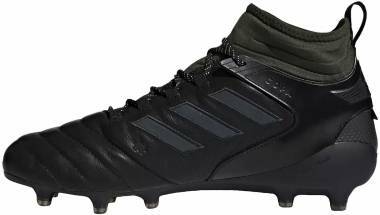 Can I use my FG Adidas Copa football boot on other surfaces? Keep in mind that an FG Adidas Copa football boot is made for firm grounds (FG) only. Using it on other surfaces will greatly affect its durability. 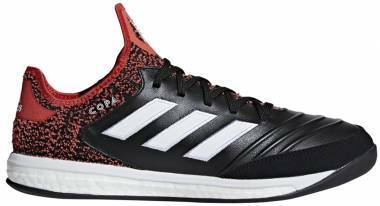 However, there are other Adidas Copa football boot variations that are made explicitly for soft grounds (SG), artificial grass (AG), turf fields (TF), and indoor courts (IN). Does a fold-over flap tongue provide any additional benefit when it comes to performance? No, it does not enhance a player’s performance on the pitch in any way. Since the original Adidas Copa Mundial was designed in the 1970s, flap tongues were the trend back then. With the introduction of the 5.8-ounce Adidas f50 adiZero, Nike, Puma, and other football shoe manufacturers followed suit with more lightweight football boots. Thus, the big flap tongues slowly died leaving the Adidas Copa Mundial with the classic look that it is known for today. However, there are claims that the flap tongue, when folded, does provide a larger striking zone than when it is left up. Can I cut the tongue of my Adidas Copa football boot? It is possible to cut the tongue, but that would change the overall structure of the material. Also, due to the elastic nature of the Adidas Copa 17.1 tongue, you will end up with strings dangling everywhere. What is the correct way to wear the tongue? Because of its unique design and length, people often have varied preferences in wearing the tongue. Some like to leave it as it is. Some want to fold it under the laces to keep it down. Whether you fold it or let it be, an Adidas Copa football boot is still a classic sight to behold. Is the Adidas Copa Mundial available in colorways other than black? Yes, there is a limited-edition White/Metallic Gold colorway of this best-selling Adidas Copa football boot. Adidas also released the Samba colorways, namely Solar Slime, Vivid Berry, Blast Purple, Solar Blue, and Solar Zest. Which playing positions are recommended to use the Adidas Copa 17.1? This Adidas Copa football boot is best for midfielders and defensive players because it provides excellent protection when passing and tackling the ball. Which football boot silo from other brands is the Adidas Copa football boot comparable with? 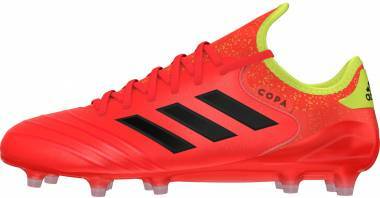 The Adidas Copa football boots can be compared with Nike Tiempo, Nike Premier, and Puma King football boots.